I saw this small but GORGEOUS waterfall from the highway on the way to Waimea Canyon and I just had to stop. It is so picture perfect I thought it must be man made at first, and was expecting to see a house or resort or something nearby but nope, nothing. 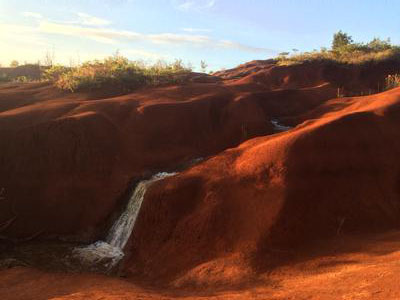 There is a pull out about 100 feet down the road past it on the right side of the highway (falls are on the left) if you’re coming from Waimea proper, on your way to the canyon. The rounded red earth hills against the flowing water were just incredible. It was accessible from the road (there is no path but its a relatively short climb down the embankment to the little 6foot diameter pool in the photos, it’s a little steep in places but totally doable for most people including kids and those without a lot of hiking experience). The river that feeds the falls continues up the hill and out of sight, as well as down the hill a ways, who knows how far. It reminds of a “natural water slide” I experienced in Maine as a kid, which was basically just a river with multiple successive small rock sluices you could slide down, each of which would end in a 3-5 foot waterfall and spit you out into a little pool at the end…until you got to the last one which was about 20 feet high (and therefore unsafe for us kids to slide, although a few older people did it). I didn’t try to swim in it as I was alone but it looks possible, or at least maybe wading. Judging from the shoeprints in the red earth there have been others who have found it and climbed down to enjoy it. I couldnt stay long as I wanted to hit the canyon by sundown, but I would definitely come back again with more time and a buddy.